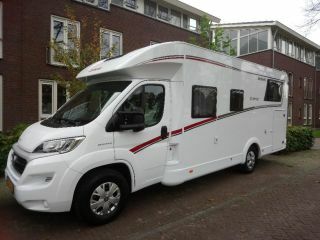 Chausson - Luxury 5 person as good as new spacious camper. Feel the freedom of a holiday with a camper. Our spacious, very young modern camper has two single beds at the back, which can be joined together to form a large double bed, a pull-down bed in the front and a sitting area that can be transformed into a bed. 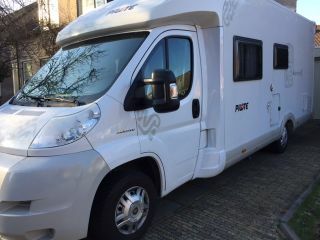 The camper is equipped with 2 rotating pilot seats, spacious sitting area, rear view camera, navigation, toilet, shower, large fridge, separate freezer, plenty of cupboard space, awning, large garage and complete inventory. The camper is ready for a nice holiday! 1. Landlord will clean the camper from inside and outside, with full gas tank and fuel tank to tenant. When returning, the camper must also be cleaned from inside and outside and the gas and fuel tank must be filled. Also, the dirt and clean water tank must be emptied and the toilet cleaned. 2. If it is found that parts of the inventory are not present, the replacement costs will be charged. Spacious Luxury Camper with many comforts.